First of three line-up announcements including artists and speakers to participate at the 11th annual A3C Festival & Conference. 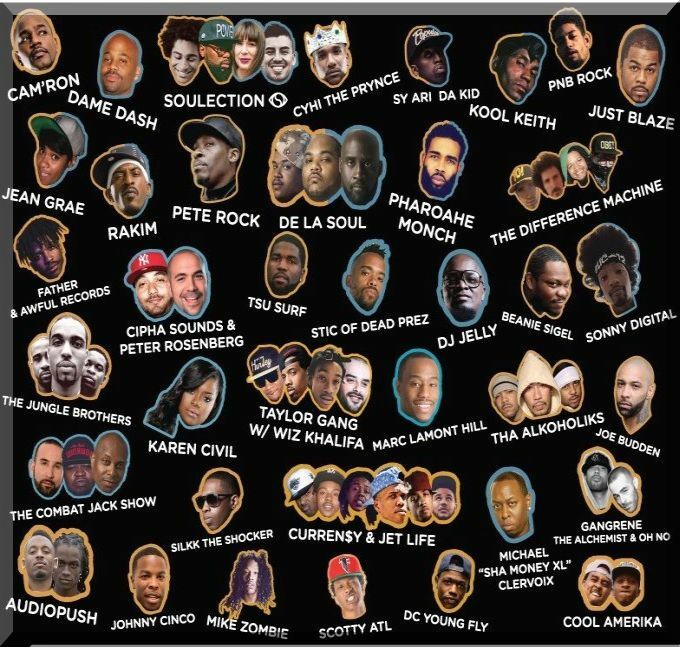 The internationally recognized five-day festival and conference will feature hip-hop icons: De La Soul, Rakim, Cam’ron, Dame Dash, Just Blaze, Curren$y & Jet Life, Jean Grae, Cyhi the Prynce Pharoahe Monch, Soulection Executive Team, Kool Keith, PNB Rock & The Difference Machine. We are really excited about our third and final artist and speaker announcement featuring: 2 Chainz, Boosie BadAzz, Ryan leslie, Shanti Das, Maino, Dungeon Family (Big Gipp, Cool Breeze, Backbone), DJ Scream, Coach K, Crooked I, Kyambo “Hip-Hop” Joshua, OG Maco, Key!, Sacha Jenkins, FRKO, Sir Michael Rocks, Zaytoven, Kenny Burns, TM88, Brandon “Jinx” Jenkins, Organized Noize (Ray Murray, Rico Wade & Sleepy Brown), Kap G, Young Dolph, Travis Porter, Cap 1, Short Dawg and Skooly. There are NOW a limited number of Single Day All-Access A3C Passes on sale! Single Days passes will sell out, so if you know you can only make 1 day… you might want to scoop those. Second of three installments of A3C artists and speakers to participate at this years events, include: Taylor Gang & Wiz Khalifa, Pete Rock, Jungle Brothers, Beanie Sigel, Peter Rosenberg & Cipha Sounds, Joe Budden, Awful Records & Father, Marc Lamont Hill, Karen Civil, Combat Jack, Sonny Digital, Sha Money XL, Tha Alkaholiks, Scotty ATL, Johnny Cinco, Tsu Surf, Silkk The Shocker, Mike Zombie, DC Young Fly & Stic of Dead Prez. 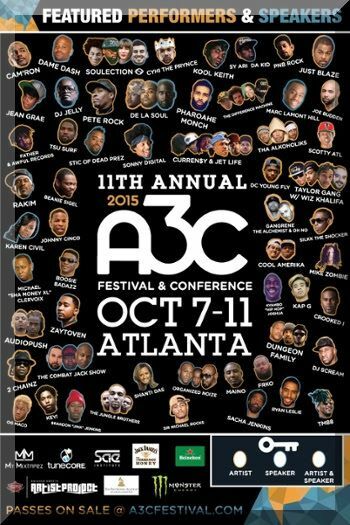 2015 A3C will take place October 7th-11th, 2015, in Atlanta’s eclectic Old 4th Ward, along Edgewood Ave, and East Atlanta Village. A3C has moved the Conference Center to The Loudermilk Center, and the host hotel to the Sheraton Atlanta Hotel. The A3C Pro-Audio Conference Center will remain at the SAE Institute of Atlanta, and A3C has partnered with the Atlanta Streetcars to move A3C attendees around Atlanta for free. A3C is very proud to announce the launch of The Formula: An Academic Symposium with Morehouse College at the 11th annual A3C Festival & Conference. The Formula will take place at the A3C Conference Center on Thursday, October 9th and is accessible with a VIP, All-Access, or Conference Pass. For more information about the A3C Festival & Conference, taking place in Atlanta on October 7th-11th, 2015, visit www.a3cfestival.com. Follow A3C on Facebook.com/A3Cfestival and Twitter – @A3C and Instagram – @A3CFestival and the hashtag is #A3C2015.